We have already went through various examples using spring, To understand spring please refer here. Integration with Spring JDBC, Spring ORM etc. 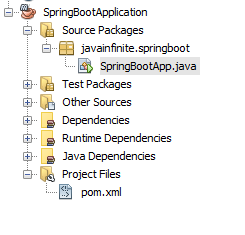 Now let us see an basic example to create spring boot application in Netbeans. We have created basic spring boot application!